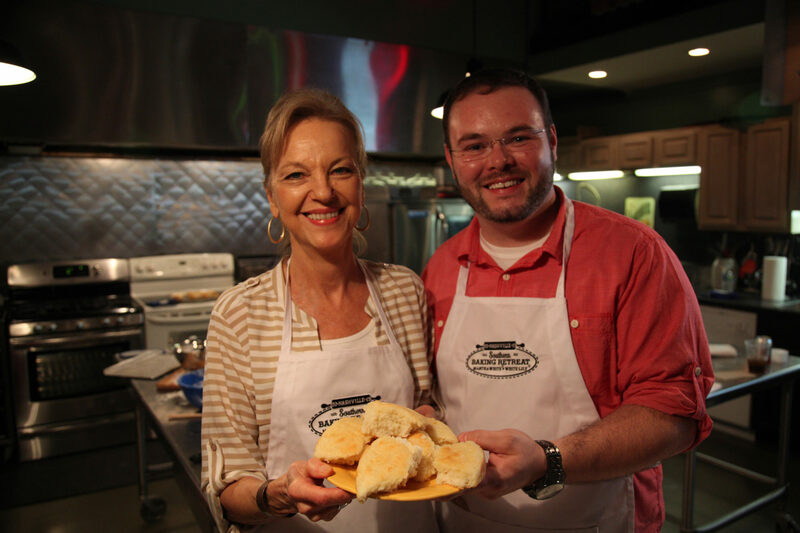 Last week I had the unbelievable opportunity to be invited to Nashville along with 9 other bloggers for the Southern Baking Retreat hosted by Martha White and White Lily. It was an absolutely amazing experience. I’m working on a recap post to give you all the details. While I was there, I met a woman that quickly earned my adoration. Linda Carman has served as the test kitchen director for Martha White for years. She works to develop new recipes and products for Martha White. She is one of those salt-of-the-earth, quintessentially Southern women who just charmed her way right into my heart. One of the days of the conference were spent talking, learning, and baking biscuits (I’ve got another post in the works for you there, too). As we were talking with Mrs. Linda, she began telling us a story about her mother’s china. She said that unlike most folks, they used the good china a lot. It wasn’t just reserved for super special occasions. They made occasions special by pulling out the china – not the other way around. She explained that when her mother first got a dishwasher, she used to always put her good china in there. Now, we all know that for the most part we’re told not to do that. Well, sure enough, the dishwasher beat just about all of the gold off of the rim of her plates. Today, Mrs. Linda still uses that china some. The vague gold rim can just barely be seen – worn away from all that washing. But each time she is reminded of all the meals that were made special by that china. Sure, to some, all they see are plates, cups, bowls, and saucers that are badly worn. But Mrs. Linda sees all of the memories. I learned a lot from Mrs. Linda. I even got to make biscuits with her. But I think the one thing that I took away from my time with her is that we shouldn’t just pack the china away in a special cabinet, never to be used. A simple weeknight meal can be made something special just by pulling out the good china. I urge you to do just that. Make an ordinary meal special. Maybe one day your children will be able to look at your worn dishes and have their hearts filled with happy memories just like Mrs. Linda. These super easy pull-apart biscuits are a favorite at our house. We’ve done them with blueberries, peaches, strawberries – you name it. I think the glaze is what really makes these special. I hope y’all enjoy them as much as we do. Preheat the oven to 425° F. Line a baking sheet with parchment paper or silicone baking mat, or lightly spray it with non-stick cooking spray. In a large bowl, whisk together the baking mix and the sugar. Add about half of the blueberries to the mixture and lightly toss. Turn the dough out onto the prepared baking sheet. Carefully press it into a rectangle that is about 10 inches by 7 inches. Pour the remaining berries on top of the dough and press them lightly into the dough. Using a paring knife, score the dough to make 12 to 15 biscuits. Bake 15 to 17 minutes or until the biscuits are golden brown. Make the glaze by combining the remaining 1/2 cup whipping cream with the 2 cups of powdered sugar. Mix well. Drizzle over the warm biscuits. Linda is just the sweetest soul. Gosh, I wish we lived near her, don’t you? Had the time of my life meeting her and you! I will remember this experience for the rest of my life. 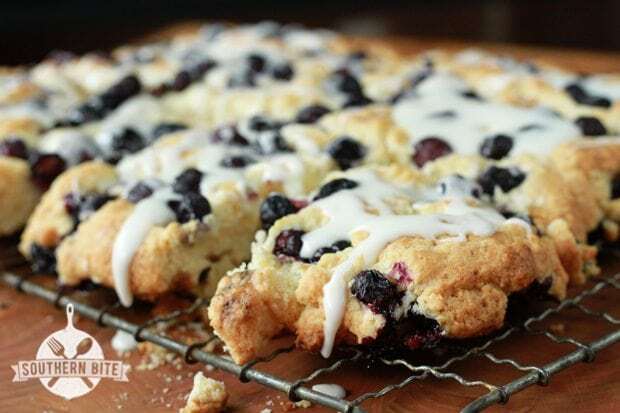 Oh, and these blueberry biscuits WILL be made at my house very soon!! I do wish I lived closer! It was such an incredible time and I’m just thrilled to have you as my new buddy. There are just some people that you meet them for the first time and feel like you’ve known them your whole life. You are one of those people. KISS HEATHER AND JACK AND GIVE YOURSELF A BIG HUG FROM ME. These look delicious! I will be making them soon and can even use gluten free baking mix so my husband can enjoy them too! I so agree with Mrs. Linda about the china. She sounds like a dear. Yum! These look delicious. I have been lucky enough to make friends with a blueberry farmer and have been looking for a good blueberry recipe! Sounds like a good friendship to me! I hope you enjoy these. Dropping by to see what ya got goin’ on per Brandie with The Country Cook. Awesome site and the blueberry biscuits look amazing!! Thanks, Teri! Tell Brandie I said hello! I can’t wait to read your post about the baking trip. 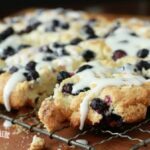 Love this blueberry biscuit recipe. Thanks. Thanks, Jen! I’ll get the post up soon. My those biscuits look great and blueberry season will be coming here in Maine, soon. Love the message about using the good china, life is too short to save things for good…I go to yard sales and it makes me sad that some old timers saved gifts for “good” instead of using and enjoying them. Who is more special than yourself, your family and friends? Enjoy each day and thanks for a wonderful post. I made this on Sunday and I reserve the right to remain silent on how much of it I ate!! lol Delicious!! LOL! I’m so glad that you liked it. I’ll admit I’m guilty too. There’s just something about that glaze! Thanks, Evangeline! I truly do think we should take more opportunities to make ordinary meal extra-ordinary and this is such a simple way to do just that. Could half and half be substituted for the whipping cream? Absolutely, though you may have to add some more powdered sugar to the glaze to get it to the right consistency.
. What are my beautiful dishes doing stored away in the china cabinet? They’re coming out to use! The biscuits look amazing. My husband will love these. I love all your recepies! Its hard to cook in a house where one of us(me) eats everything and he doesnt eat flour or sugar! Thank you! I’ve never made it with them, but I’m sure it would work. It might be easier to add them while they are frozen as freezing them sometimes changes the texture a bit and makes them soggy. They might just bust up rather than knead into the dough. I used frozen blueberries in making a tart a while back and the whole tart turned purple. I think using frozen ones might give you purple biscuits. I love the comments about the good china. My mother always got the china out every Sunday, for every birthday and for any other time she wanted. She never had a mechanical dishwasher. Her 8 kids did the job for her. What a great tradition! I love make everyday events seem special! No, no need to whip the cream.